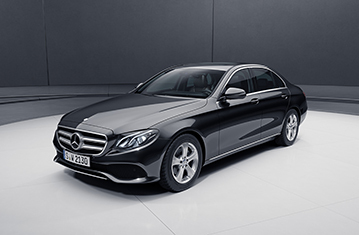 The E-Class is fitted as standard with Mercedes Benz's 'PRE SAFE'' system which senses when an accident is about to occur and primes the restraint and protection systems in readiness for the collision. In Euro NCAP’s frontal and side barrier impacts, the PRE-SAFE System was not activated. The passenger compartment of the E-Class remained stable in the offset frontal impact test. Dummy readings indicated good protection of the knees and femurs for both the driver and passenger dummies. Mercedes-Benz demonstrated that a similar level of protection would be provided to occupants of different sizes and to those sat in different positions. In the full-width rigid barrier test, protection of the dummies was good for all critical body areas except the chest, protection of which was adequate for the driver and marginal for the rear passenger. In the side barrier test, the E-Class scored maximum points with good protection of all critical body areas. In the more severe side pole impact, protection of the chest was adequate and that of all other body areas was good. Tests showed that the front seats and head restraints provided good protection against whiplash injury in the event of a rear-end collision, and a geometric assessment of the rear seats also indicated good protection. Additional protection against whiplash injuries is provided by the autonomous emergency braking system which operates at the low speeds typical of city driving. Impact against a stationary car was avoided at all test speeds and the E-Class scored maximum points for this part of its assessment. In the offset frontal test, protection of the 6 and 10 year dummies was good or adequate. In the side barrier test, protection was good for all critical body areas for both dummies. The E-Class has an automatic airbag deactivation system which switches off the front passenger airbag when a rearward-facing child restraint is used in that seating position but switches it on again when the seat is occupied by a large child or an adult. All of the restraint types for which the E-Class is designed could be properly installed and accommodated in the car. The E-Class has an active bonnet. Sensors in the bumper detect when a pedestrian has been struck and actuators lift the bonnet to provide greater clearance between the bonnet surface and the hard structures in the engine compartment. Mercedes-Benz showed that the system worked over a range of speeds and for a variety of pedestrian statures, so the system was tested in the deployed (raised) position. Good results were recorded over almost the entire bonnet surface, showing a high level of protection to the head of a struck pedestrian. The bumper also offered good protection to pedestrians' legs. However, protection of the pelvis was poor in all tested areas. The standard-fit autonomous emergency braking system is capable of detecting pedestrians and showed good results in Euro NCAP's tests of this functionality. närmar sig stillastående bil Se AEB City Krock undveks upp till 70 km/h. The E-Class has a standard seatbelt reminder system for the front and rear seats. The car is also equipped with a standard driver-set speed limitation system. The autonomous emergency braking system demonstrated good results in Euro NCAP's tests of its performance at highway speeds. Data reviewed by Euro NCAP, together with additional tests, demonstrate that the rating of the E-Class also applies to the CLS-CLass.